A new exhibition called "Where Great Writers Gather: Treasures of the British Library" kicked off Thursday at Shanghai Library. 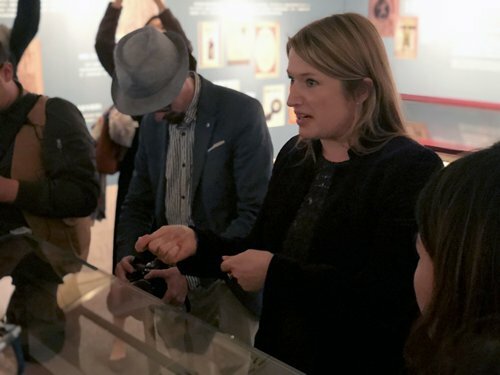 Local lovers of British literature have a chance to understand more about five of the greatest writers of the English language via their original manuscripts. 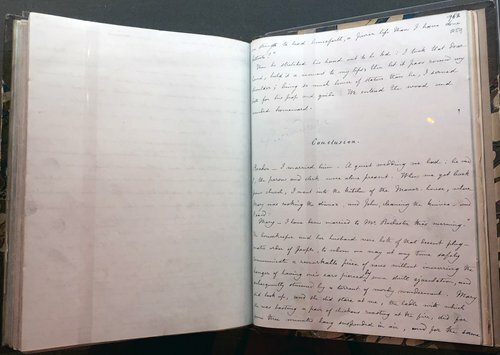 Running until April 15, the exhibition brought the original manuscripts, letters and early drafts by Charlotte Brontë (1816-1855), D.H. Lawrence (1885-1930)), Percy Bysshe Shelley (1792-1822), T.S. Eliot (1888-1965) and Charles Dickens (1812-1870) over from the British Library, the national library of the United Kingdom, to Shanghai for the first time, along with Chinese translations, adaptations and commentaries about the works of these writers. According to Alexandra Ault, the British curator, the five exhibits from the British Library were selected from 80,000 literary and historical manuscripts held by the library, intending to highlight their process of writing and other unknown stories about how those works were created and published. 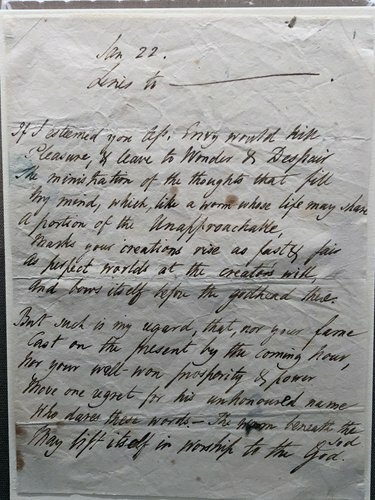 One of the exhibits is the original manuscript of Sonnet to Byron by romantic poet Percy Bysshe Shelley. According to Ault, the poem was probably written in 1821. The folds on the tiny manuscripts are still clear, which implies that it had been folded and put in a notebook or pocket. Originally owned by Shelley's wife, Mary Shelley (1797-1851), the author of Frankenstein. After years' of circulation, the manuscript was purchased by a famous collector who donated it to British Library in the 20th century. Jane Eyre by Charlotte Brontë is one of the most well-known foreign novels among Chinese readers, who will be able to see the famous line from the concluding chapter ("Reader - I married him") at the exhibit. The exhibited manuscript is a copy of an earlier draft. The story was rejected by many publishers before it was published in 1847. Ink fingerprints and the type compositor's name in pencil are still clear. Several letters from T.S. Eliot to his friends including drafts of his poems for Old Possum's Book of Practical Cats, a book of comic verse, are also displayed in the exhibition. 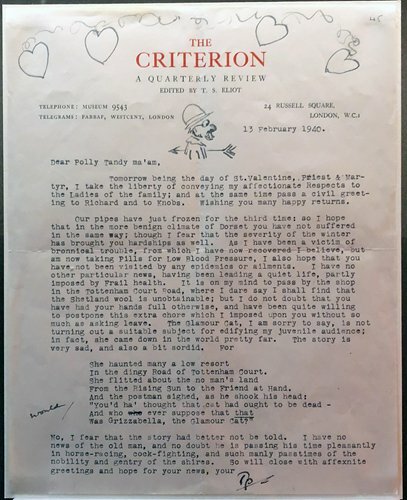 In the letter, written in February 1940, one day before the Valentine's Day, the writer drew some hearts and a man shot by Cupid's arrow. 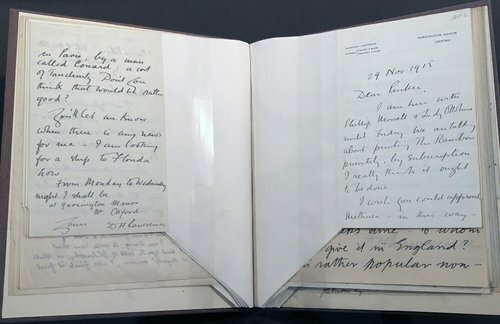 Visitors can also read letters from D.H. Lawrence at the exhibition, in which the writer talked about the ban on of his novel, The Rainbow, due to the sexual descriptions; he sought an alternative solution to getting it published. 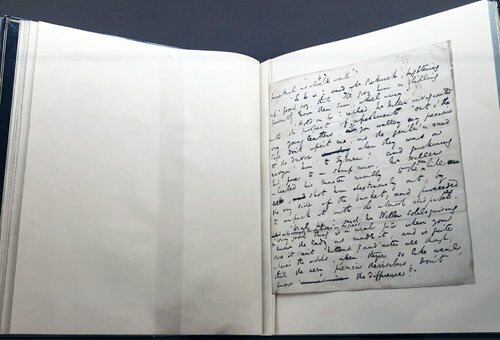 Pages from the original manuscript of The Pickwick Papers written by Charles Dickens in 1836 to 1837 are also exhibited. According to Ault, different from Brontë's neat manuscript, Dickens' handwriting is usually messy, which caused complains among compositors. Apart from the British Library's collections, visitors can also find some precious articles held by Shanghai Library and those lent from private collectors. For instance, George Bernard Shaw (1856-1950) sent a blank photo album with a black sheepskin cover to Chinese dramatist Huang Zuolin (1906-1994) as a gift in 1935. In the handwritten inscription written in 1937, he wrote: "Rise up, China! You are the future of the eastern world!" The earliest Chinese translation of parts of English fiction in China - Gulliver's Travels by Jonathan Swift (1667-1745) - was published in 1872 on Shen Bao, a newspaper published from 1872 to 1949. English books used by Tu An (1923-2017), a famous Chinese translator, while working on the first Chinese translation of Shakespeare's Sonnets, Charles Dickens' personal collection of books, D.H. Lawrence's signed limited edition of the poetry collection Pansies as well as the signed first limited edition of Lady Chatterley's Lover are also displayed. Shanghai Library will hold a series of activities including themed lectures, English literary readings and a translation competition to enhance interaction between the exhibition and readers. The exhibition comes from an agreement signed by the two libraries at a Sino-UK high-level people-to-people dialogue in London in December of 2017, which is considered a milestone in the relationship between the two libraries. Chen Chao, director of Shanghai Library, said that the event marks both a high-level cultural exchange between China and the UK and a spiritual interaction between the people of both countries. Alexandra Ault makes an introduction of the exhibition at the event Wednesday.